Chiropractic changed my life from the first treatment. 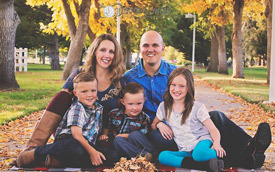 As he grew up on a cattle ranch, Dr. Chad had difficult and physically demanding tasks. Due to the numerous wrecks and crashes that wreaked havoc on his body, he experienced headaches, back pain and more. When Dr. Chad got injured while participating in a rodeo in high school, he went to the chiropractor for help. After just one adjustment, he knew that he would embark on a career in chiropractic. He also was finally able to get rid of medications and rely on chiropractic to keep his health optimized. Dr. Chad chose to attend Palmer College of Chiropractic in Davenport, Iowa as it’s the fountainhead of chiropractic. He appreciated the outstanding faculty and state-of-the-art facilities but particularly was impressed by the rigors of the program, which included courses in anatomy, physiology, biochemistry, and neurology. He also liked that he didn’t have to deal with blood! For Dr. Chad, his greatest success is seeing people heal naturally, from newborns to the elderly. He also cares for many athletes of all ages. With an array of techniques in his toolbox, Dr. Chad can provide customized chiropractic to meet the needs of every patient who walks through our doors. Dr. Chad has helped thousands of people with the technique he’s most thankful for — Advanced Muscle Integration Technique (AMIT). The technique can help muscles to function better and range of motion to increase. While he was getting certified in AMIT, Dr. Chad had the privilege of working with John Stockton, retired point guard for the Utah Jazz. In addition to offering AMIT, Dr. Chad also utilizes Pulse Electromagnetic Field (PEMF) Cellular Exercise which can boost the body’s ability to heal. You can have more energy and less pain. Dr. Chad and his wife Destiny, who is his high school sweetheart, have three kids: Natalie, Dallan and Blake. They enjoy camping, fishing and taking their dog Tiny on trips. Dr. Chad also enjoys being a rancher and cowboy. He is a member and past president of the Idaho Association of Chiropractic Physicians. Additionally, he’s a member of the Twin Falls Chamber of Commerce, and he donates to and is part of the Foundation for Chiropractic Progress. Discover the difference that chiropractic care can make in your life. Schedule an appointment with Dr. Chad today at Nielson Family Chiropractic!